Was Negligent Gas Station Security a Factor in the Shooting of Innocent Bystanders? 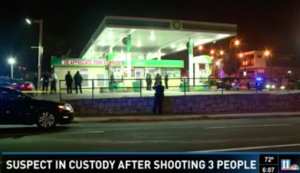 A shooting outside of a BP gas station in southwest Atlanta reportedly left three people injured, including two innocent bystanders Saturday morning, January 14, 2017. The shooting follows a recent string of “high-profile cases of crimes at the pump” in Atlanta, per FOX 5 reports. Did negligent security contribute to this Atlanta gas station shooting? We represent individuals and families in Georgia who have suffered a tragic loss or injury as a consequence of negligent property security, and we have recovered tens of millions of dollars for our Clients. Read Our Legal Take to find out if the victims may have a legal avenue for justice and claims for substantial compensation in Georgia, or call now for a free consultation with out legal team: 404.842.1600. Have there been prior incidents of violence on property? If so, were any additional security precautions implemented by the gas station owner or management to deter crime? Were any attempts made to contact police at the start of the initial altercation, inside the gas station? By law, property owners in Georgia are required to protect all those legally on the premises from any foreseeable harm. Should the facts of this matter reveal that the gas station owner failed to provide adequate security, the victims may elect to pursue legal claims for their injuries.